Sie sind hier: Home » Beiträge mit dem Schlagwort "Energiewende"
Verschandeln bald Windrad-Müllberge den Osten? b) That this rate is higher than in other countries, which presumably don’t care so much about climate action. Compared with the US the difference should be massive. Here we can see US decarbonization since 1966, as emissions data starts only in 1965. We can see the same for Germany since 1971, as that’s when the country’s GDP data starts – at least in the World Bank’s website. Ooops: now only is Germany’s rate about the same as the US’s, it’s also lower than it was before! In fact, to be more precise, the 2000-2015 average is 2.06% for Germany and 2.26% for the US. Over 1971-1999, Germany’s average is 3.13%. But this figure is inflated by the very high increases of 1989-1992, when the formerly communist economy of East Germany shut down most of the CO2-intensive industries (with little effect on GDP). Excluding those four years, Germany’s pre-Energiewende average is still 2.58%, or a bit higher than since 2000 – though one must mention the figures for the 70s are ‘helped’ by high oil prices. I guess the best one could say is that Germany’s decarbonization rate is about the same as before. Just to be clear: a higher rate of decarbonization is the minimum one could ask of a climate policy. It’s necessary, but not sufficient, because it’s still possible for that policy to cost so much as to make the reduction in emissions not worth it. 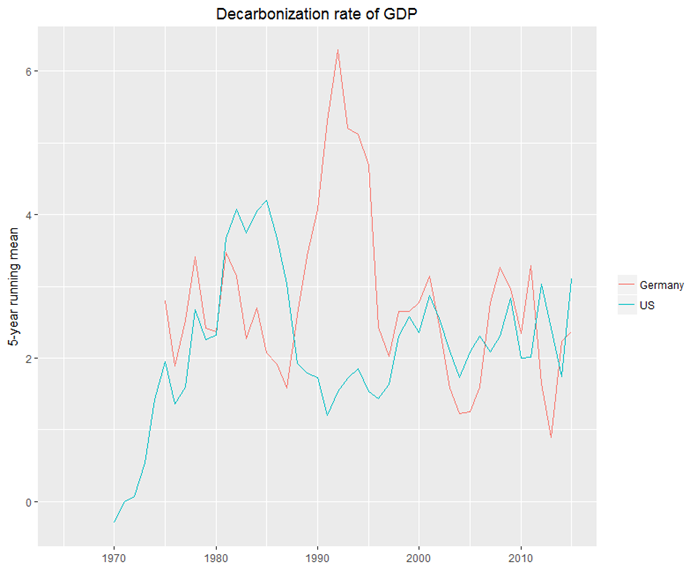 One shouldn’t automatically consider a higher rate of decarbonization better than a lower one. In other words, one has to consider cost-effectiveness – as with every other thing we spend money on. In Germany’s case there is no point debating the cost-effectiveness of climate policies, because their effectiveness is at best zero. Advocates of emission cuts are entitled to their own opinions, not to their own facts. Ganzen Artikel auf WUWT lesen. Pellworm sollte zum Modell für ganz Deutschland werden: E.on wollte auf der Nordseeinsel beweisen, dass sich eine ganze Region selbst mit Energie versorgen kann – dank Strom aus Windkraft und Sonne. Jetzt zieht der Energiekonzern unverrichteter Dinge wieder ab. Langsam drehen sich die Windräder auf den Feldern um Neubrandenburg herum. Sauberer Strom, ökologisch erzeugt. Doch die vermeintliche Idylle könnte bald Risse bekommen. Zwar sind saubere Energiequellen derzeit deutschlandweit auf dem Vormarsch, und die Zahlen beeindrucken: 2016 erzeugten 27270 Anlagen 45911 Megawatt Strom. “Windkraft macht rund 13 Prozent der gesamten deutschen Stromproduktion aus”, sagt Wolfram Axthelm vom Bundesverband Windenergie. Und das Geschäft mit dem Ökostrom ist nach wie vor lukrativ, denn das Erneuerbare-Energien-Gesetz (EEG) sichert allen vor dem Jahr 2000 errichteten Anlagen eine Einspeisevergütung zu. Doch damit ist Ende 2020 Schluss. Weiterlesen in der Supper illu (pdf). India will not be able to meet its Paris climate agreement commitments in the coming years if it carries through with plans to construct nearly 370 coal-fired power plants, according to University of California, Irvine and CoalSwarm researchers. “India is facing a dilemma of its own making,” said UCI associate professor of Earth system science Steven Davis, co-author of a study published today in the American Geophysical Union journal Earth’s Future. “The country has vowed to curtail its use of fossil fuels in electricity generation, but it has also put itself on a path to building hundreds of coal-burning power plants to feed its growing industrial economy.” Further, by developing all of the planned coal-fired capacity, India would boost the share of fossil fuels in its energy budget by 123 percent. If the nation also met its goal to produce at least 40 percent of its power from nonfossil sources by 2030, the total power being generated would greatly exceed its own projected future electricity demand. Davis added: “We’ve done calculations to figure out that India’s Paris pledges might be met if it built these plants and only ran them 40 percent of the time, but that’d be a colossal waste of money, and once built, there’d be huge incentives to run the plants more despite the nation’s contrary climate goals.” India relies heavily on coal; 70 percent of the country’s power comes from plants burning the fuel. Because of its historically low cost and accessibility (India has large domestic coal reserves), it’s seen as furthering India’s quest to become a manufacturing and economic powerhouse and as a way to provide electricity to the roughly 300 million people in the nation who don’t have it. But the UCI and CoalSwarm researchers stressed that there are significant downsides to the fossil fuel habit. In addition to spewing harmful soot and other types of air pollution coal-burning power plants are the largest source of carbon dioxide on Earth, accounting for 41 percent of all CO2 emissions in 2015. Choices that individual countries make in regard to their energy mix have planetwide consequences. “India’s proposed coal plants will almost single-handedly jeopardize the internationally agreed-upon climate target of avoiding more than 1.5 degrees Celsius of mean global warming,” Davis said. The new device is based on metamaterials, synthetic materials that exhibit exotic properties not available from natural materials. Padilla and doctoral student Xinyu Liu used a metamaterial engineered to absorb and emit infrared wavelengths with very high efficiency. By combining it with the electronically controlled movement available from microelectromechanical systems (MEMS), the researchers created the first metamaterial device with infrared emission properties that can be quickly changed on a pixel-by-pixel basis. As reported in The Optical Society’s journal for high impact research, Optica, the new infrared-emitting device consists of an 8 × 8 array of individually controllable pixels, each measuring 120 X 120 microns. They demonstrated the MEMS metamaterial device by creating a “D” that is visible with an infrared camera. The researchers report that their infrared emitter can achieve a range of infrared intensities and can display patterns at speeds of up to 110 kHz, or more than 100,000 times per second. Scaling up the technology could allow it to be used to create dynamic infrared patterns for friend or foe identification during combat. In contrast to methods typically used to achieve variable infrared emission, the new technology emits tunable infrared energies without any change in temperature. Since the material is neither heated nor cooled, the device can be used at room temperature while other methods require high operating temperatures. Although experiments with natural materials have been successful at room-temperature, they are limited to narrow infrared spectral ranges. “In addition to allowing room-temperature operation, using metamaterials makes it simple to scale throughout the infrared wavelength range and into the visible or lower frequencies,” said Padilla. “This is because the device’s properties are achieved by the geometry, not by the chemical nature of the constituent materials that we’re using.” The new reconfigurable infrared emitter consists of a movable top layer of patterned metallic metamaterial and a bottom metallic layer that remains stationary. The device absorbs infrared photons and emits them with high efficiency when the two layers are touching but emits less infrared energy when the two layers are apart. An applied voltage controls the movement of the top layer, and the amount of infrared energy emitted depends on the exact voltage applied. Rainer Thiel: Die “deutsche Energiewende” vernachlässigt die Prinzipien der Nachhaltigkeit, nachdem zwischen wirtschaftlichen, sozialen und ökologischen Belangen ein Gleichgewicht hergestellt werden soll. Tatsächlich wurde Klimaschutz zum beherrschenden Thema, dem alle anderen Ziele untergeordnet werden. Die Themen Wirtschaftlichkeit und soziale Auswirkungen finden kaum statt. Nehmen sie nur das EEG, das dem Ausbau erneuerbarer Energien einseitig Vorrang einräumt. Das hat gravierende Auswirkungen auf unsere Wirtschaft und massive Umverteilungswirkungen im sozialen Bereich. Holger Douglas: Immer mehr Flächen sollen für Windräder ausgewiesen werden. In Nordrhein-Westfalen soll bis zum Jahr 2020 über die Hälfte des Strombedarfs aus Windkraft kommen. Ein utopisches Ziel? Rainer Thiel: Bis 2020 sollen in NRW 15% der Stromversorgung aus Windenergie kommen. Dafür ist ein Flächenbedarf von immerhin 54.000 ha vorgesehen. Das sind ca. 1,6% der Landesfläche. In Großstädten oder in der Nähe von Flugschneisen gibt es kaum Raum für Windkraftanlagen. Der Druck auf die Flächen im ländlichen Raum ist daher enorm. Man kann regelrecht von Flächenfraß reden. Bei Windkraftanlagen spielt das sonst so hochgehaltene Ziel des Flächensparens keine Rolle mehr. Auch der Artenschutz gerät unter die (Wind-)Räder. Zu Recht befürchten Naturschützer die Kannibalisierung des Naturschutzes durch die Energiewende. Es wird vernichtet, was eigentlich geschützt werden soll, und wir sind ja erst am Anfang. Holger Douglas: Für Grevenbroich sollen 684 ha für Windkraftflächen bereitgestellt werden. Die Stadt zeichnet sich jetzt nicht wie zum Beispiel eine Insel in der Nordsee durch übermäßigen Windreichtum aus. Dennoch sollen fünf Prozent der Gemeindefläche damit zugekleistert werden. Ziemlich viel oder? Rainer Thiel: Für Grevenbroich bedeutet die Umsetzung der Energiewende eine doppelte Belastung. Hier sind große Braunkohlekraftwerke und hier beginnt der Tagebau Garzweiler. Die Menschen leben in Nachbarschaft zu den Kraftwerken und Tagebauen. Viele finden dort gute Arbeits- und Ausbildungsplätze. Jetzt stehen diese Arbeitsplätze unter Druck und die Wertschöpfung vor Ort bricht weg. Und nun soll ausgerechnet hier die massivste Ausweisung von Windkraftanlagen im ganzen Regierungsbezirk Düsseldorf erfolgen, ca. 5% der Stadtfläche soll Windkraftvorrangzone werden. Das würde das Landschaftsbild der “Landesgartenschau Stadt Grevenbroich” zerstören. Holger Douglas: Sichere Renditen von 7 – 8 Prozent für die Produzenten von Wind und Sonnenstrom – Strompreise so hoch wie nie. Was läuft schief? Rainer Thiel: Die sicheren Renditen für Wind- und Solaranlagenbetreiber sind eine wichtige Ursache für hohe Strompreise. Hier findet die größte staatlich veranlasste Umverteilung innerhalb der Bevölkerung statt, die es in Deutschland jemals gab. Das Jahresvolumen von 23,1 Milliarden Euro überwiegt sogar den Länder-Finanz-Ausgleich. Über lange Zeiträume müssen private Stromkunden anderen privaten Geldanlegern Renditen garantieren, von denen alle anderen nur träumen können. Das wird zwar mit dem Klimaschutz begründet, aber sozial betrachtet ist das völlig daneben. Mieter in Ballungsräumen wie in NRW müssen ja schon hohe Mieten zahlen und werden so zusätzlich belastet. Andere, die genug verdienen, um in Wind und Sonne zu investieren oder sich die Anlagen aufs eigene Dach schrauben lassen, werden zusätzlich belohnt. Sie bekommen selbst dann ihre Vergütung, wenn ihre Anlagen wegen eines Überangebots von Wind- oder Sonnenenergie abgeriegelt werden müssen. Das ist doch irre! Holger Douglas: Wie wirken sich denn die im Vergleich zu unseren Nachbarländern extrem hohen Energiekosten auf die Unternehmen aus? Rainer Thiel: Eine Studie aus den USA (IHS) kommt zu dem Ergebnis, dass alleine von 2008 bis 2013 Deutschland bereits ca. 52 Milliarden Euro Nettoexportverluste hinnehmen musste, wegen der im internationalen Vergleich stärker gestiegenen Industriestrompreise. Hinzu kommen Sorgen um die Versorgungssicherheit und unsichere Rahmenbedingungen der Energiepolitik. Betriebsräte aus großen Unternehmen sagen mir, dass Investitionen ausbleiben oder an andere Standorte mit niedrigeren Stromkosten verlagert werden. Die andere Seite der Medaille ist, dass die Vorrangeinspeisung von Wind- und Sonnenenergie zu Ramschpreisen die Börsenpreise so unter Druck setzen, dass konventionelle Kraftwerke kein Geld mehr verdienen können. Viele moderne Gaskraftwerke sind schon aus dem Markt gedrängt worden. Milliarden Investitionen wurden vernichtet. Das betrifft besonders unsere Stadtwerke. Insgesamt werden hier viele gute Arbeitsplätze gefährdet und vernichtet, sowie Vermögen der Städte entwertet. Holger Douglas: Gerade in Ihrem Wahlkreis mit seiner großen Energiewirtschaft sowie Metall- und Chemieindustrie, die ebenfalls viel Energie verschlingen, sehen Sie die drastischen Folgen der Energiewende. Wie sehen sie aus und bereitet Ihnen diese Entwicklung Sorgen? Rainer Thiel: Mir bereitet die Energiewende, so wie sie gemacht wird, große Sorgen. Für unsere Metall- und Chemieindustrie ist neben bezahlbaren Strompreisen die Frage der Versorgungssicherheit mindestens genauso wichtig. Und die ist bei Wind- und Sonnenenergie noch lange nicht gegeben. Trotzdem wird ein gewaltiger Druck aufgebaut, Braunkohlekraftwerke möglichst schnell zu schließen. Manche Klimaaktivisten fühlen sich legitimiert, Gewalt gegen Menschen und Anlagen auszuüben. Andere überbieten sich geradezu mit immer neuen Kohleausstiegsplänen. Wir sind hier ständig im Stress, Strukturbrüche zu verhindern. Unsere Region hat noch gute Industriestandorte, hier liegen die Grundlagen für die Wohlstandsfähigkeit unserer Gesellschaft. Sozialer Zusammenhalt, funktionierende Infrastruktur, Integrationsherausforderungen meistern, das geht doch nur, wenn unsere Wertschöpfungsketten nicht zerstört oder überstrapaziert werden. Holger Douglas: Die Landschaft wird durch Tausende von Windrädern zerstört, auf den Dächern befinden sich Zehntausende von Solaranlagen. Dennoch spart Deutschland laut Statistik bisher noch kein einziges Gramm CO2 ein? Warum? Rainer Thiel: Der CO2-Ausstoß ist in Deutschland seit 2009 nicht gesunken, trotz ständigen Zubaus erneuerbarer Energien. Installierte Leistung ist eben nicht zur Verfügung stehende Leistung. Darum haben wir heute zwei Kraftwerksparks, einen konventionellen, der dafür sorgt, dass unsere Gesellschaft nicht zusammenbricht, und einen aus erneuerbaren Energien. Kohle-, Gas- und Ölkraftwerke haben eine installierte Kraftwerksleistung von ca. 80 Gigawatt, und die stehen auch zur Verfügung. Sonne- und Windkraft kommen zusammen ebenfalls auf etwa 80 Gigawatt, die stehen aber nur gelegentlich und oft zu ungünstigen Zeiten zur Verfügung. Einen Zustand ohne Strom kann unsere hochtechnisierte Gesellschaft nicht überstehen – denken Sie nur an Krankenhäuser, Telekommunikation, Tankstellen oder Schienenverkehr, ganz zu schweigen von unserer Industrie, oder Fahrstühlen in öffentlichen Gebäuden . Im Winter, wenn der Energiebedarf steigt, gibt es weniger Sonne und oft keinen Wind. Da werden sogar alte Ölkraftwerke in Österreich wieder hochgefahren, um Versorgungssicherheit zu gewährleisten. Holger Douglas: Mittlerweile fordern auch Politiker, dass das Erneuerbare-Energien-Gesetz und Energiewende weg müssen. Wie sieht Ihre Position aus? Rainer Thiel: Dass das EEG so nicht bleiben kann, ist längst vielen klar. Die Energiewende muss wieder auf die Füße gestellt werden. Das ökonomisch Sinnvolle und das technisch Machbare müssen gegenüber dem Wünschbaren wieder mehr Gewicht bekommen. Die Erneuerbaren Energien werden langsam erwachsen, sie müssen Systemverantwortung übernehmen und sich dem Wettbewerb stellen. Der weitere Ausbau muss mit dem Netzausbau abgestimmt werden. Die Kosten müssen endlich transparent dargestellt und gerecht verteilt werden. Diese Energiewende wurde ja nicht von den Stromkunden beauftragt. Es macht keinen Sinn, Anreizsysteme zu fördern, deren Risiken andere tragen müssen. Ein Ausbau von Kapazitäten, die sich nur rechnen, wenn subventioniert wird, überfordert letztlich das gesamte System. Die physikalischen Grundlagen müssen geklärt werden. Das betrifft neben der offenen Frage der “Großspeicher” auch Natur und Landschaft. Was bedeutet z.B. 100% erneuerbare Energien angesichts der geringen Energiedichte je Flächeneinheit für unsere Naturflächen, für Wälder und Tiere? Holger Douglas: Was muss zunächst getan werden? Rainer Thiel: Mich stört der erzieherische und oft moralisierende Unterton, mit dem ambitionierter Klimaschutz mit immer ehrgeizigeren Zielen vorangetrieben werden soll, verbunden mit Drohkulissen und Angstszenarien. Die Risiken und Nebenwirkungen dieser Energiewende müssen ehrlich benannt werden. Da wünsche ich mir einen aufgeklärten demokratischen Diskurs. Klimaschutz ist wichtig. Soziale Gerechtigkeit aber auch. Wir dürfen uns nicht dem Diktat der bloßen Zahl hingeben. Wenn wir bis 2030 z.B. 36 oder 38% CO2 einsparen, dann ist das Spitze in Europa. Dann muss wegen einer kaum seriös berechenbaren Lücke von 2-4% kein Strukturbruch erzwungen werden, der Arbeitsplätze und Wertschöpfung vernichtet. Oder z.B. ein Verbot von Verbrennungsmotoren ab 2030, wieder so ein symbolischer Meilenstein. Holger Douglas: Sehen Sie langsam Mehrheiten für Ihre Position? Rainer Thiel: Ich bin überzeugt, dass die Menschen schon genauer hinsehen als manche glauben. Natürlich wünschen wir uns alle Klimaschutz und eine möglichst gesunde Umwelt. Genauso wissen wir aber auch, dass wir in einer Industriegesellschaft leben und unsere Wohlstandsfähigkeit auch von Versorgungssicherheit abhängt. Ich sehe durchaus eine Mehrheit für eine Klimaschutz- und Energiewendepolitik mit Realitätssinn und Augenmaß. Holger Douglas: Herzlichen Dank für das Gespräch! Replacing traditional cooking fires and stoves in the developing world with “cleaner” stoves is a potential strategy to reduce household air pollution that worsens climate change and is a leading global killer. A new study by researchers from the University of British Columbia, University of Washington and elsewhere — which measured ambient and indoor household air pollution before and after a carbon-finance-approved cookstove intervention in rural India — found that the improvements were less than anticipated. Actual indoor concentrations measured in the field were only moderately lower for the new stoves than for traditional stoves, according to a paper published in June in Environmental Science & Technology. The study is one of only a handful to measure on-the-ground differences from a clean cookstove project in detail, and the first to assess co-benefits from a carbon-financed cookstove intervention. Across all households, average indoor concentrations of particulate matter, an unhealthy component of cooking smoke that can contribute to lung and heart disease, increased after the intervention stoves were introduced — likely because of seasonal weather patterns or food rituals that required more cooking. The median increase, however, was smaller in homes where families exclusively used intervention stoves — 51 micrograms per cubic meter, compared to 92 micrograms per cubic meter for families who used both intervention and traditional stoves and 139 micrograms per cubic meter for the control group of families who continued cooking on a traditional stove. “On the one hand, there was less of an increase in some pollution levels and that’s a win. But on the other hand, it feels pretty far from a complete solution,” said co-author and UW professor of civil and environmental engineering Julian Marshall, who conducted the research at the University of Minnesota. The cookstove intervention the research team studied was the first stove intervention in India approved for financing under the Kyoto Protocol’s Clean Development Mechanism, which allows wealthier countries to reduce their climate emissions by investing in projects that provide climate benefits elsewhere. Among 187 families who cooked with traditional stoves that burn wood or agricultural waste in the Koppal District of Karnataka in southern India, approximately half were randomly assigned to receive intervention stoves — a single-pot “rocket” cookstove that burns the same biomass fuels. Randomization allowed the two groups to be comparable on demographic and socio-economic variables that may influence the outcome of measures, thereby minimizing potential bias. The community-based organization leading the intervention has a history of working in the region and took care to address issues promptly and ensure that the new stoves were culturally acceptable, such as lowering the height of the stoves to meet the ergonomic needs of the women using them. The research team took detailed measurements of how much wood the two groups burned — as well as air pollution within the household cooking areas and at sites in the center and upwind of the village — before and after the intervention stoves were introduced. The researchers also measured black carbon — a less studied component of smoke that has negative health effects and also contributes to climate change — and found intervention stoves increased the proportion of that pollutant in the smoke. Next steps for the research team include investigating whether giving families more choices among intervention stoves — with the goal of finding one that would meet a wider range of their needs — could further reduce reliance on traditional, more polluting stoves. The research was funded by the University of Minnesota’s Initiative for Renewable Energy and the Environment. Co-authors include Grishma Jain and Karthik Sethuraman of the Resource Optimization Initiative in Bangalore, India; Jill Baumgartner at McGill University’s Institute for Health & Social Policy; Conor Reynolds of UBC and the University of Minnesota’s Department of Civil, Environmental and Geo-Engineering; and Andrew P. Grieshop of North Carolina State University’s Department of Civil, Construction and Environmental Engineering. Das ernüchternde Ergebnis der Studie sollte eigentlich für alle Bürger hochinteressant sein. Eine Google-News-Suche zeigt jedoch: Auch knapp einen Monat nach Erscheinen der Pressemitteilung hat keine Zeitung und kein Sender das Thema aufgegriffen. Zu brisant. Ein weiterer Fall für unsere Rubrik “Schweigen im Walde“. “ Only an induced implosion of the fossil fuelled business as usual through disruptive changes in investment dynamics, technology and consumer behavior could move those scenarios closer to reality”. As an individual, Malte Meinshausen had a track record with Greenpeace. One eco-activist tract in 2009 said Meinshausen and his co-worker, Bill Hare, had “long been key members of the Greenpeace International climate team.” Meinshausen’s name was often on Greenpeace press releases in 2001-03. Meinshausen’s and Hare’s research papers and a graph for Greenpeace wound up being cited in the 2007 IPCC report. (No, Virginia, not all IPCC authors are “essentially humourless scientists in white coats who go around and measure things” as ex-PM Kevin Rudd claimed). Meinshausen today is content with nothing less than a global “zero carbon” target for 2055-70 , when he himself will be retired or deceased. Die Basis der Schellnhuber-Visionen ist bekannt: Klimamodelle aus dem Computer, die weder die Mittelalterliche Wärmeperiode vor 1000 Jahren, noch die Erwärmungspause der letzten 17 Jahre reproduzieren können. Es ist schon erstaunlich, dass sich eine hochtechnisierte und eigentlich aufgeklärte Gesellschaft so etwas einfach gefallen lässt. Es ist befremdlich, dass sich Fachkollegen kaum trauen, gegen überzogene und klimaalarmistische Prognosen des PIK und anderer Akteure öffentlich vorzugehen. Die wissenschaftliche Community ist offenbar zu klein, die möglichen Nachteile einer Kritik sind augenscheinlich zu groß. Verlust von finanzieller Förderung, Karriereblocker etc etc. Das International Institute for Applied Systems Analysis gab am 21. Juli 2016 eine Pressemiteilung heraus, in der das Abholzen von Regenwald für Palmöl-Plantagen verurteilt wird. Allerdings werden auch Lösungsvorschläge angeboten, um Nachhaltigkeit zu erreichen. Wichtigste Botschaft: Es gibt angeblich noch reichlich unbewirtschaftete potentielle Anbauflächen außerhalb der Regenwälder. Land used for palm oil production could be nearly doubled without expanding into protected or high-biodiversity forests, according to a new study published in the journal Global Environmental Change. The study is the first to map land suitable for palm oil production on a global scale, while taking into account environmental and climate considerations. “There is room to expand palm oil production and to do it in a sustainable way,” says IIASA researcher Johannes Pirker, who led the study. Die neue Premierministerin Theresa May schafft das Ministerium für Klimawandel ab. Die Zusammenlegung mit dem Energie-Ressort dürfte eine Abkehr der Briten vom Klimaschutz bedeuten. Setzt sich diese Position global durch, hat Deutschland schlechte Karten. Blick nach China. Trotz Pariser Klimaabkommen hat sich die chinesische Regierung dazu entschlossen, 150 Milliarden Dollar in den kommenden 5 Jahren in neue Kohlekraftwerke zu investieren. Nicht ganz, wozu sich die Staatschefs Ende 2015 eigentlich verpflichtet hatten. Ein bewährtes Verfahren: Man sagt das eine und tun das andere. Nachzulesen bei The Daily Caller. The average German daily electrical energy demand is 1.4 TWh during winter months but can peak to 1.6 TWh. A standard (65Ah) car battery can store 0.78 KWh of energy. Therefore to power Germany for one day without any significant wind or solar input during winter would need at least 1.8 x 10e9 (1,800,000,000) batteries! MISES-INSTITUT: Herr Wendt, in Ihrem Buch „Der Grüne Blackout“ bezeichnen Sie die Energiewende als „veritablen Thriller, dem keine spannungsfördernde Zutat fehlt“. Wer ist Täter? Wer ist Opfer? WENDT: Täter waren 1999 zunächst eine kleine Gruppe von Bundestagsabgeordneten um SPD-Politiker und Solarlobbyisten Hermann Scheer, die das Erneuerbare-Energien-Gesetz (EEG) durchgesetzt hatten, dessen gewaltige Umverteilungswirkung damals kaum jemand überblickte. Heute gibt es eine relativ kleine, aber enorm einflussreiche Gruppe von Profiteuren, von Windpark-Fondsverkäufern über Landbesitzer, die Boden für bis zu 100 000 Euro pro Jahr und Windrad verpachten, bis zu Glücksrittern wie dem Solarword-Chef Frank Asbeck. Opfer beziehungsweise Zahler der Veranstaltung sind die Stromkunden, die in diesem Jahr durch die Ökostromumlage insgesamt 24,8 Milliarden Euro für grünen Strom überweisen werden, der an der Börse nur 1,8 Milliarden wert ist. Opfer sind gutgläubige Leute, die in Windparks investiert haben und jetzt feststellen, dass zwei Drittel aller Windräder im Binnenland defizitär laufen. Unter Druck geraten auch alle, die in energieintensiven Branchen arbeiten: je weiter die Strompreise steigen, desto prekärer werden ihre Arbeitsplätze. Ein grünes Jobwunder hilft ihnen auch nicht, das ist nämlich ausgeblieben. In der Tat: in der DDR gab es Fünfjahrespläne. Das EEG garantiert Betreibern von Ökostromanlagen nicht nur feste Abnahmepreise über 20 Jahre; die Energiewendeplaner wollen auch detailliert festlegen, wie Deutschlands Energiewirtschaft im Jahr 2050 aussehen soll. Das ist in Zahlen gegossene Hybris. Wir haben uns sehr gefreut, zu lesen, dass Sie Ludwig von Mises’ Interventionismus-Theorie in der Energiewende bestätigt sehen. Skizzieren Sie Ihre Beobachtungen doch bitte für uns. Ludwig von Mises sagte mit seiner Interventionstheorie, dass der Staat, wenn er in den Markt eingreift, um ein Problem zu lösen, zwar unter Umständen dieses eine Problem mildert, aber dafür mindestens zwei neue schafft. Statt den ersten Eingriff zurückzunehmen, interveniert er weiter, mit der Folge, dass die Dysfunktionalität ständig vergrößert wird. Am logischen Endpunkt der Entwicklung verheddert er sich selbst hoffnungslos in seinen widersprüchlichen Regeln und Eingriffen. Bei der Energiewende lässt sich dieses Problem mustergültig studieren. Ein Beispiel aus vielen: Schon ab 2011 ließ sich absehen, dass die Produktion von Windstrom in Norddeutschland an vielen Tagen die Kapazität des Stromnetzes übersteigen würde – ein Teil der Energie kann also durch die Leitungen gar nicht abtransportiert werden. Die Bundesregierung traf eine Regelung, die ausschließlich im Interesse der Windmüller lag: Jede Kilowattstunde, die hätte produziert werden können, aber nicht ins Netz passt, muss von den Verbrauchern trotzdem mit der vollen Einspeisevergütung bezahlt werden. Die Folge: Windparkinvestoren scherten sich künftig erst Recht nicht darum, ob es dort, wo sie bauen wollten, überhaupt genug Netzkapazität gab, und verschlimmerten das Problem innerhalb weniger Jahre drastisch. 2014 zahlten die Stromkunden über die Netzentgelte erstmals an die 100 Millionen Euro für nie produzierten Strom. Für dieses Jahr dürfte der Betrag noch einmal kräftig steigen. Wenn die Regierung jetzt entscheiden würde, dass nur noch jede tatsächlich eingespeiste Kilowattstunde vergütet wird, brächen allerdings die Kalkulationen vieler Windparks zusammen. Also drehen sich in Norddeutschland mehr und mehr Windmühlen teuer subventioniert im Leerlauf – während der Staat sich anschickt, auch für konventionelle Kraftwerke südlich des Mains Subventionen auszureichen. Namentlich Gaskraftwerke verdienen kein Geld mehr, weil sie nur noch als Lückenspringer Strom ins Netz liefern dürfen. Allerdings werden sie wegen der erratischen Grünstromproduktion dringend gebraucht. Weil die Stromkosten dadurch und durch andere Maßnahmen ständig steigen, diskutieren Politiker bekanntlich auch schon, ob sie nicht demnächst Strom für Einkommensschwache aus Steuermitteln subventionieren sollten. Dann wäre nicht nur die Produktion staatlich gestützt und der Markt fast komplett abgeschnürt, sondern auch noch der Konsum eines Gutes staatlich gelenkt. Warum hat die Energiewende in den Medien nicht mehr Kritiker gefunden? Nun, sie hat durchaus viele Kritiker. Vielleicht sollte ich dazu eine kleine Geschichte erzählen: Zwischen Politikern beziehungsweise Verbandsvertretern und Journalisten gibt es die so genannten Gespräche unter Drei. Das heißt: die einen reden frei darüber, was sie wirklich denken. Die anderen benutzen das Gesagte nur für ihre Meinungsbildung, zitieren aber nichts wörtlich. Ein Chef einer großen Einzelgewerkschaft sagte mir in einem dieser Gespräche zum Thema Energiewende: „Die einzelnen Bundestagsparteien unterscheiden sich da nur im Grad ihres Wahnsinns.” Ein führendes Mitglied der Unionsfraktion: „Bei der Energiewende ist es so wie bei einem Fuhrwerk, das in die Sackgasse fährt: es muss dort wieder herauskommen, wo es hineingefahren ist. Man braucht also nicht hinterherzulaufen. Von Unterhaltungswert ist allein das Wendemanöver.“ Ich könnte noch etliche andere Zitate von Politikern, Wirtschaftswissenschaftlern und Managern zitieren, allerdings die Namen nicht nennen – denn das würde die Vertraulichkeit brechen. Zitieren kann ich immerhin Bundeswirtschaftsminister Sigmar Gabriel, der beim Besuch des Solarunternehmens SMA Solar in Kassel am 17. April 2014 sagte: „Die Energiewende steht kurz vor dem Aus. Die Wahrheit ist, dass wir die Komplexität der Energiewende auf allen Feldern unterschätzt haben. Die anderen Länder in Europa halten uns sowieso für Bekloppte.“ Gegen Gabrieles Annahme war ein Lokaljournalist anwesend, der die einigermaßen unverstellten ministeriellen Worte verbreitete. Gabriel dementierte auch nichts. Er wiederholte diese Worte allerdings in keinem Interview. Die Frage ist: warum sagen selbst Mitglieder der Funktionselite nur dann, was sie über die Energiewende denken, wenn sie sicher sind oder glauben, dass nichts in die Öffentlichkeit dringt? Der Klimawandel und der damit verbundene Meeresspiegelanstieg bedrohe ganz besonders Südostasien, schrieb das Potsdam-Institut für Klimafolgenforschung (PIK) in einem Bericht für die Weltbank. Dabei hatte das PIK jedoch nicht nur die Ozeanzyklen übersehen, die den Meeresspiegel in der Region mal schneller und mal langsamer ansteigen lassen, sondern auch unbequeme Folgen der Palmölgewinnung. Die Energiewende und der damit verbundene hohe Bedarf an Palmöl gibt Grund zu großer Sorge: Küstennahe Sumpflandschaften in Südostasien werden unter einem grünen Deckmäntelchen im großen Maßstab entwässert, um lukrative Palmöl-Pflanzungen anzulegen. Dazu gibt es oft dann noch grüne, blaue und sonstwiefarbene Öko-Engel aufgestempelt, die die Maßnahmen im Ausland scheinheilig als nachhaltig ausgeben. In Wahrheit lässt die massive Entwässerung das Land absinken, was bei Sturmfluten dem salzigen Meerwasser Tür und Tor öffnet. In den kommenden Jahrzehnten wird so der Lebensraum der Menschen versalzen und zerstört, die wirtschaftliche Grundlage der Region geraubt und die Biodiversität untergraben. Durch die Entwässerung gelangen zudem größere Mengen an zusätzlichem CO2 in die Atmosphäre, was den grünen Anstrich des Palmöls weiter abblättern lässt. Die Erkenntnisse wurden im Rahmen einer Studie gewonnen, die kürzlich von Deltares im Rajang-Delta in Malaysia im Auftrag von Wetlands International durchgeführt wurde. Agricultural production in vast regions of South East Asia will be lost in the coming decades as a result of flooding of extensive lowland landscapes due to unsustainable development and management of peat soils. About 82% of the Rajang Delta in Sarawak (East Malaysia) will be irreversibly flooded within 100 years and substantial areas are already experiencing drainage problems. This will increasingly impact local communities, the economy and biodiversity and will develop over time into disastrous proportions unless land-use on the region’s peatlands is radically changed. Therefore Wetlands International calls for conservation and sustainable management of peatlands in South East Asia. A study commissioned by Wetlands International and executed by Deltares suggests that extensive drainage of peatlands for oil palm cultivation in the Rajang river delta results in such massive land subsidence that this will lead to extensive and devastating flooding incidents in the coming decades. The study analysed an area of 850,000 hectares of coastal peatlands in Sarawak, and produced a model which demonstrates that in 25 years 42% of the area will experience flooding problems. In 50 years the percentage affected will increase to 56% while the nature of flooding becomes more serious and permanent, and in 100 years 82% of the peatlands will be affected. Peat soils are made up of 10% accumulated organic material (carbon) and 90% water. When water is drained from the peat soil, the carbon in the peat soil is turned into CO2 and emitted into the atmosphere causing climate change. This carbon loss reduces the peat volume and thus causes the peat soil to subside. This process continues as long as drainage is continued and until the soil surface reaches sea or river levels constraining the outflow of water and thus leading to flooding. In tropical conditions, peat drainage causes the soil to subsidence at a rate of 1 to 2 metres in the first years of drainage, and 3 to 5 centimetres per year in subsequent years. This results in the subsidence of the soil by up to 1.5 metres within 5 years and 4 to 5 metres within 100 years. “The study results are very relevant to Indonesia as well, where we observe the same patterns of peat swamp forest conversion, drainage and expansion of oil palm and Acacia for pulp wood plantations”, said Nyoman Suryadiputra, Director of Wetlands International – Indonesia. “Thousands of square kilometres in Sumatra and Kalimantan may become flooded in the same way as the Rajang delta, affecting millions of people who depend on these areas for their livelihoods”. “Highly developed countries or regions in temperate areas, such as the Netherlands, cope with soil subsidence by building dykes and pump-operated drainage systems, but this is impossible in Malaysia or Indonesia”, explained Marcel Silvius, Programme Head for Climate Smart Land Use at Wetlands International. “The predominantly rural economy along thousands of kilometres of coastline and rivers, combined with the intense tropical rainfall makes it economically and practically impossible to implement such costly water management measures in the Southeast Asian region”. Governments and industry should therefore immediately stop the conversion of remaining peat forests to agricultural or other use, and actively promote peatland conservation and restoration. Industry will need to phase out drainage-based plantations on peatlands, as these areas will be increasingly subject to flooding and eventually become unsuitable for any form of productive land-use. Effective policies should be drawn up, implemented and enforced to conserve and ensure the wise use of peatlands. There are many crops that can be cultivated on peatlands without drainage. Over 200 commercial local peat forest tree species have been identified, such as Tengkawang (Shorea spp.) which produces an edible oil and Jelutung (a latex producing species). These can provide alternative and sustainable livelihood opportunities for local communities but require piloting, improvement of varieties and up-scaling for industrial plantations. Im Jahr 2012 stieg nach Angaben des Statistischen Bundesamtes der Stromexport stark an. 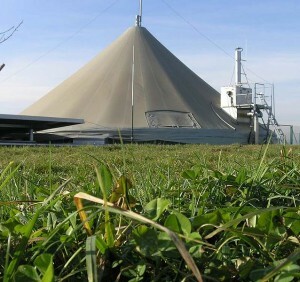 Nach 54,5 Terawattstunden (1 TwH= 1 Milliarde Kilowattstunden) in 2011 wurden in 2012 66 Twh ausgeführt. Die Einfuhr ging leicht zurück von 48,5 TwH in 2011 auf 43,8 TWh im Jahr 2012. Der Anstieg ist im wesentlichen zurückzuführen auf den Zubau Erneuerbarer Energien. Gute Nachrichten möchte man daher meinen. Doch der Überschuß wird im wesentlichen dann erzeugt, wenn Windstrom im Winter oder Solarstrom im Sommer im deutschen Netz nicht verbraucht werden kann. Dann sinkt durch den Überschußstrom der Preis an der Strombörse. Mitunter entstehen sogar negative Strompreise. Salopp ausgedrückt: wir schiessen noch Geld hinzu, damit der Strom von unseren Nachbarn abgenommen werden kann. So etwa in der ersten Januarwoche 2012, als kurzfristig bis über -50 €ct/kwh gezahlt wurden. Wer Strom abnahm, bekam 50 €ct für die verbrauchte Kilowattstunde. Prof. Manuel Frondel vom Rheinisch-Westfälischen Wirtschaftsinstitut in Essen und Professor für Energieökonomik und angewandte Ökonometrie der Ruhr-Universität Bochum kommt zum Ergebnis, dass der Export vom deutschen Stromkunden mit Milliarden Euro subventioniert wird. Denn der Öko-Strom wird in Deutschland durchschnitlich mit 18 €ct/kwh vergütet. Den durchsschnittlichen Exportpreis unseres Stromexportes errechnet das Statistische Bundesamt aber mit 5 €ct/kwh. Die Differenz von 13 €ct/kwh trägt der deutsche Stromkunde. Hier der Beitrag von Prof. Frondel vom Oekonomen-Blog. Wiedergabe hier mit freundlicher Genehmigung des Autors. Mit mehr als 13 Cent pro Kilowattstunde subventionieren deutsche Stromkunden den wachsenden Export von Ökostrom ins Ausland. Schuld ist der künstliche Boom des Ökostroms, hervorgerufen durch eine falsche Förderpolitik. Die Subventionen für erneuerbare Energien in Deutschland treiben neue Blüten: der Boom der Ökostromerzeugung führt dazu, dass in Deutschland an manchen Tagen wesentlich mehr Strom produziert wird, als von deutschen Verbrauchern nachgefragt wird. Im vergangenen Jahr hat Deutschland 66,6 Mrd. Kilowattstunden (kWh) Strom ins Ausland verkauft. Aus dem Ausland wurden dagegen nur 43,8 Mrd. kWh ins deutsche Netz eingespeist. Bleibt unterm Strich ein Exportüberschuss von knapp 23 Mrd. kWh. Der überflüssige Strom wird an unsere Nachbarländer verramscht. In Zeiten negativer Börsenstrompreise müssen sogar Entsorgungsgebühren für diesen „Strommüll“ gezahlt werden. Hinter diesem Phänomen steckt ein regelrechter Subventions-Irrsinn: Die Errichtung immer neuer Ökostromanlagen wird in Deutschland nach wie vor mit hohen Subventionen gefördert. Da an manchen Tagen der Wind nicht weht oder die Sonne nicht scheint, können konventionelle Kraftwerke jedoch nicht endgültig abgeschaltet werden. Das Angebot an Stromerzeugungskapazitäten steigt somit unaufhörlich. Resultat: Tendenziell sinkt der Preis. Die Verbraucher im Ausland freuen sich, denn sie erhalten subventionierten und zunehmend günstigeren Strom „Made in Germany“. An der Strombörse in Leipzig kostet die Kilowattstunde nur noch zwischen 4 und 5 Cent – Tendenz weiter fallend. Für die deutschen Verbraucher wird es dagegen immer teurer, denn sie zahlen die Subventionen. Sie gleichen die Differenz zwischen dem durch das Erneuerbare-Energien-Gesetz (EEG) garantierten Abnahmepreis für grünen Strom und dem Börsenverkaufspreis aus. Im Durchschnitt wird grüner Strom mit mehr als 18 Cent pro Kilowattstunde vergütet. An der Börse wird die Kilowattstunde aber für weniger als 5 Cent verkauft – mindestens 13 Cent Zuschuss je kWh bedeuten mehrere Milliarden Euro, die die Deutschen im vergangenen Jahr für den Export von Ökostrom gezahlt haben. Darüber hinaus ist die Systematik, mit der grüner Strom gefördert wird, mehr als fragwürdig: Etwa die Hälfte der Förderkosten fließt in die Photovoltaik. Dabei trägt Solarkraft gerade einmal 20 Prozent zur grünen Stromerzeugung in Deutschland bei. Und dass rund 40 Prozent der weltweit installierten Anlagen im eher sonnenarmen Deutschland stehen, zeigt welche Ineffizienzen die Subventionen verursachen. Die Liste ließe sich erweitern: So gibt es die höchsten EEG-Zuschüsse für Kleinanlagen, die aus Lebensmittelpflanzen wie Mais Elektrizität herstellen. Bestes Indiz für die mangelnde Effizienz des EEG ist die Tatsache, dass seit Einführung des EEG die durchschnittliche Vergütung für Ökostrom kontinuierlich angestiegen ist. Ein Quotenmodell wäre die effizientere Förderlösung: Die Versorger würden verpflichtet, einen bestimmten Anteil ihres Stromangebots aus Erneuerbaren zu bestreiten. Dieser Anteil würde vorrangig mit den kostengünstigsten Technologien eingehalten werden. Anders als beim EEG käme es so erstmals zu einem Wettbewerb unter den alternativen Technologien. Darüber hinaus könnte der Ökostromausbau in einem Quotenmodell mit dem Netzausbau und Deutschlands Erneuerbaren-Zielen punktgenau abgestimmt werden. Der massive Aufbau von Überkapazitäten, wie wir ihn derzeit erleben, würde eingeschränkt. All dies eröffnet die Chance, den Ausbau der Erneuerbaren und damit einen zentralen Baustein der Energiewende wesentlich günstiger zu erreichen. Prof. Dr. Manuel Frondel ist Diplom-Physiker und Diplom-Wirtschaftsingenieur und seit Oktober 2003 Leiter des Kompetenzbereichs „Umwelt und Ressourcen“ am Rheinisch-Westfälischen Institut für Wirtschaftsforschung (RWI). Seit 2009 ist er zudem Professor für Energieökonomik und angewandte Ökonometrie der Ruhr-Universität Bochum. Siehe auch Artikel “Deutsche verschenken Ökostrom für 3 Milliarden” von Jan W. Schäfer auf Bild.de. Foto oben rechts: Gerfriedc / Lizenz: This file is licensed under the Creative Commons Attribution-Share Alike 3.0 Unported license.